Let's Go! sung by Susie Tallman & Friends takes you and your children on an adventure through music: you'll explore the woods, star gaze on a cowboy's range, dig for clams in San Francisco Bay, yodel with an ostrich on a mountain and visit 22 other traditional-now-hip places. Let's Go! compiles 26 travel, camp & car songs, providing more than an hour of entertainment (perfect for road trips.) As with all Rock Me Baby Records CDs, this CD offers fresh, upbeat styles, real instruments, lots of voices, and interesting takes on the old favorites - adding cool rhythms and contemporary arrangements. Let's Go! is Susie Tallman and Rock Me Baby Records' sixth album in a collection of award-winning music, popular with both children and parents. Let's Go! was recorded in Sydney & Melbourne Australia with producers Mark O'Connor and Peter Farnan. The guest artists include Peter Maslen on drums, Greg O'Connor on ukelele and vocals, Michael Reily Burke, Maude Farnan, Stella Farnan and Roberta O'Connor on vocals. 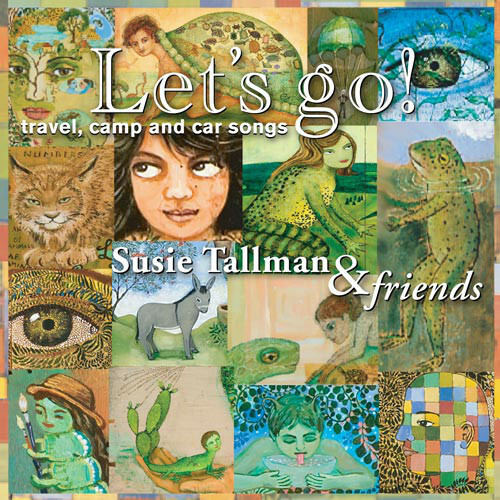 From Susie Tallman: 'Road trips and campfires make up strong childhood memories and they were always accompanied by song. Between my parents, brother and grandparents, we sung all the time. My grandfather was a park ranger-naturalist at Yosemite and Lassen National Parks in the 1930's, 1940's and 1950's. Not only did my grandfather take campers on nature hikes, he led campfires and taught songs, played the banjo and violin, so he passed down many of his camp favorites, including "Ain't Gonna Rain No More, 1000 Legged Worm, You Are My Sunshine, Oh Susanna, The Old Family Toothbrush. I decided to make this record to encourage the family to get together and sing in the car and hopefully create a soundtrack for vacations." My 2 and 4 year old girls get excited when they hear the first song on "Let's Go!" In almost no time, they've learned all the songs and love to sing along with Susie Tallman and Friends. Susie's done it again! This is a great compilation of clever songs that help make that potentially prickly "toddler drive time" a pleasure. I would recommend this to anyone with a sense of fun. My children love all of her music/CD's. We got the first 2 as gifts. It's fun for everyone to listen to and the vocals are great (adults and children). I like the updated versions and my children have learned all of the songs. It's something we don't mind listening to in the car and singing along with as we go.